Red T-shirt with BTM Crest Logo on the front under the left shoulder. On the rear you have a screenprinted rendering of the Cheetahs Always Win logo. Black T-shirt with BTM Crest Logo on the front under the left shoulder. On the rear you have a screenprinted rendering of the Bill Thomas Racecars Decal. Black Sweat Shirt with BTM Crest Logo on the front under the left shoulder. On the rear you have a screenprinted rendering of the Cheetahs Always Win logo. Gray Sweat Shirt with BTM Crest Logo on the front under the left shoulder. On the rear you have a screenprinted rendering of the Bill Thomas Racecars Decal. This is a large seven inch tall peel-off-stick decal of the BTM Crest Logo. This is a smaller sized four inch tall peel-off-stick decal of the BTM Crest Logo. This is a six inch wide peel-off-stick classic Bill Thomas Racecars decal. This is a six inch wide peel-off-stick Bill Thomas Racecars decal. 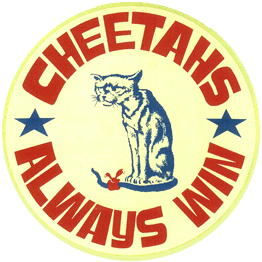 This is a large six inch tall peel-off-stick Cheetahs Always Win decal. This is a smaller sized four inch tall peel-off-stick Cheetahs Always Win decal. Black ball cap with the BTM Crest logo on front and the text "Cheetahs Always Win" on the back. Black ball cap with the Cheetahs Always Win logo on the front. Red ball cap with the BTM Crest logo on front and the text "Cheetahs Always Win" on the back.